Recently, as I delved into the National Library of Australia’s online digitalised newspapers for family research purposes, I stumbled across the following image. The newspaper was the now defunct The Australasian Sketcher with Pen and Pencil produced in Melbourne Victoria between 1873 and 1889. The image below was published in the Saturday issue of 17 April 1875. 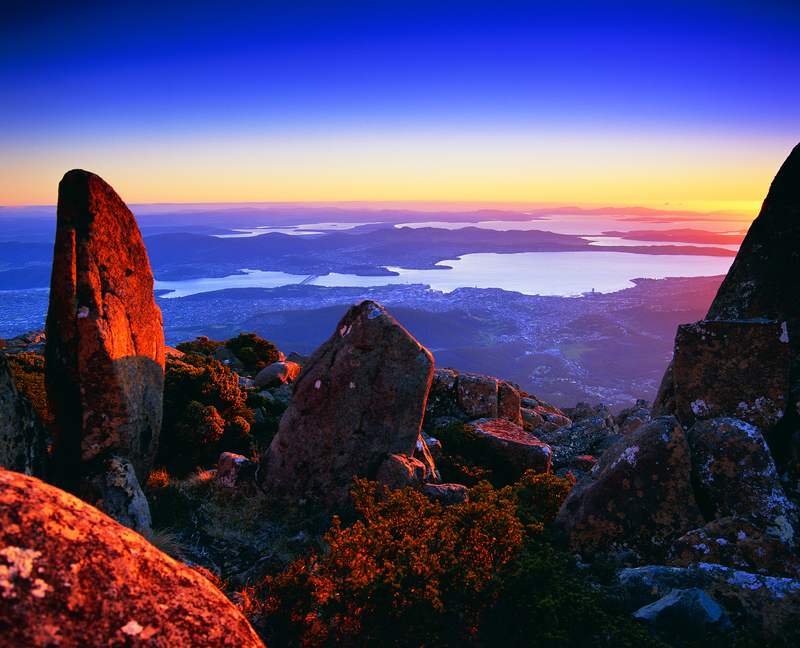 Taken from the vantage point of Mount Wellington we are looking down onto the dots of a growing Hobart city, across the Derwent River to the eastern shore which is as yet unsettled in any dense sort of way. As usual, the River is the star! This entry was posted in Derwent River, Hobart, Mount Wellington, Tasmania and tagged Derwent River, Hobart, Mount Wellington, National Library of Australia, The Australasian Sketcher with Pen and Pencil on May 24, 2017 by Tasmanian traveller. I took a series of forest photos most of which are blurred. I am adding some here to give you an idea of what parts looked like – sorry about the quality. 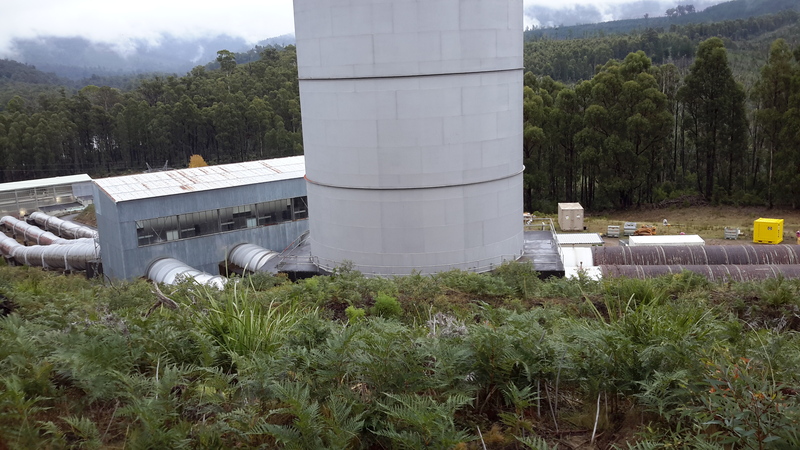 Then the white shape of the Wayatinah Power Station appeared between the tree trunks. 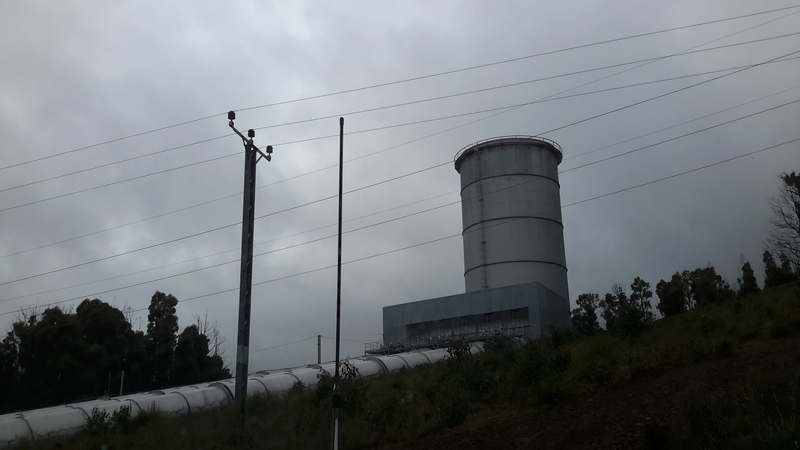 The closer I came to the Wayatinah Power Station the steeper the hills seemed. For vehicles travelling down the road, the final gradient requires a low gear in a 4WD. The drizzle on a day like the one on which I went, meant the clay and soil track surface was exceptionally slippery and dangerous for the inexperienced or inept. Then I was out in the open again. 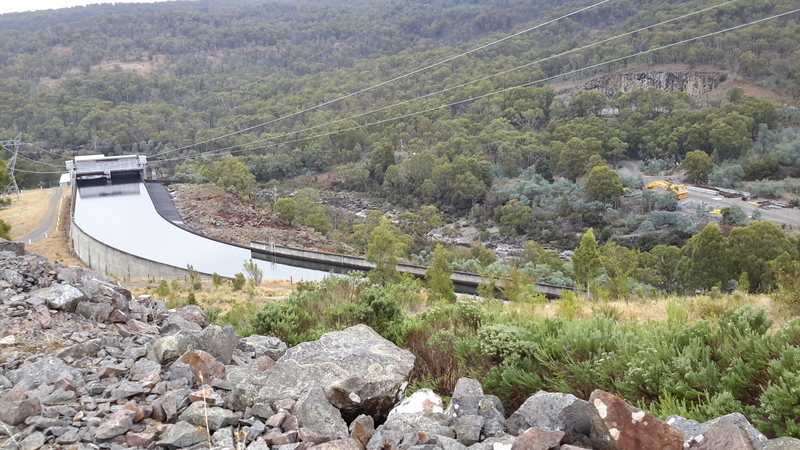 This time looking down to Lake Catagunya past the Wayatinah Power Station. To my right, additional infrastructure punctured the sky. 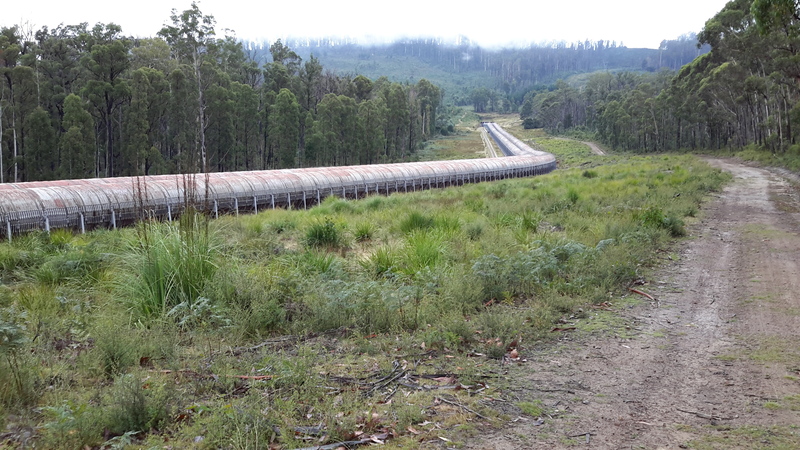 Further up the hill and connecting to the huge surge tank, the snaking length of wooden penstocks started. See my earlier post for more information about wooden penstocks here. Can you remember the wonderful photos which Andrew took in this blog posting? 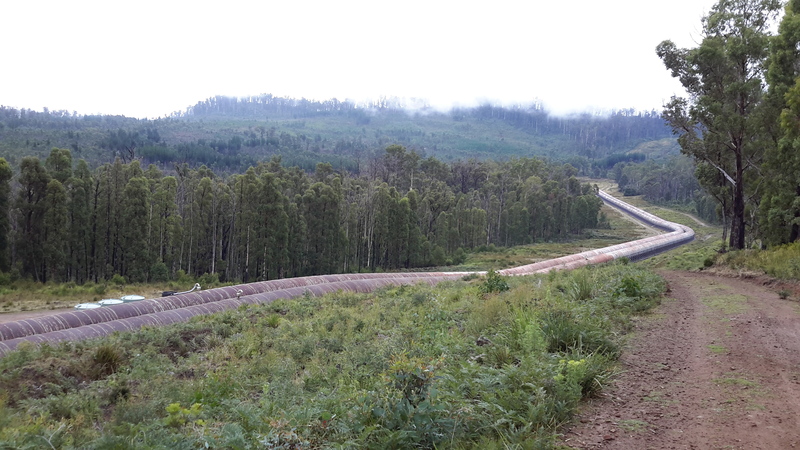 My photos are less detailed but still show the dramatic line of the penstocks. I ended the day with a thick coating of mud on my boots and a smile on my face. Yet another day offering me a memorable experience along the Derwent River. I am especially grateful for the extensive information and access provided by GL. 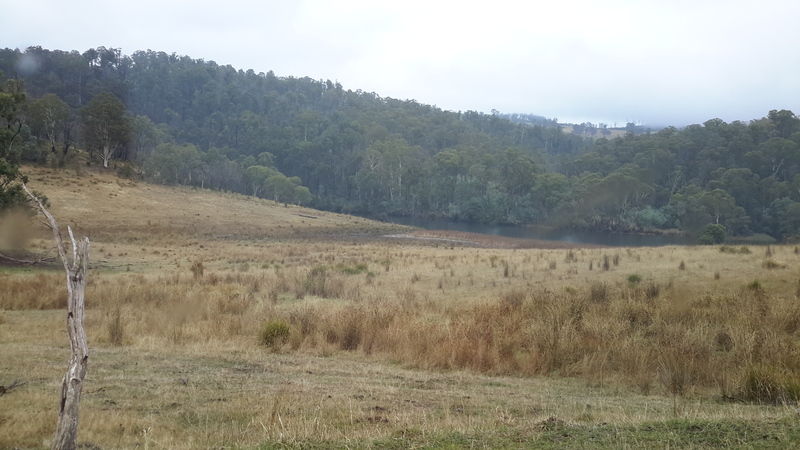 Please note that private and corporate owners control access to this section of the Derwent River and the many gates are locked with an assortment of sophisticated processes. General public access is not available. 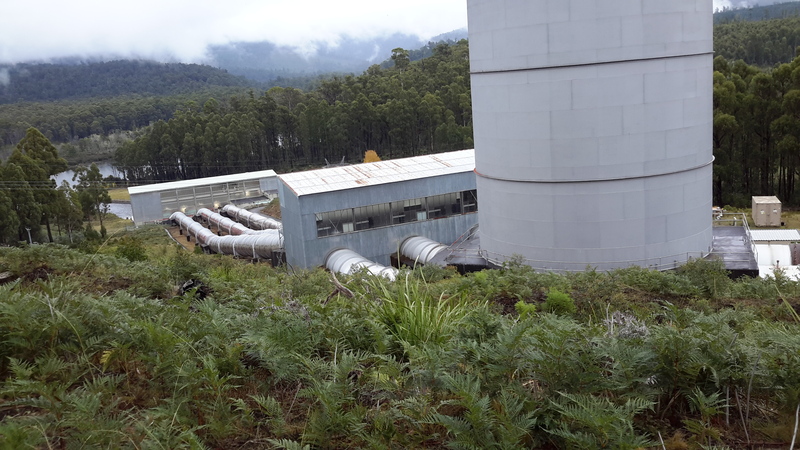 This entry was posted in Derwent River, Tasmania, Walking and tagged Catagunya, Derwent River, Lake Catagunya, Wayatinah, Wayatinah Power Station on May 4, 2017 by Tasmanian traveller. I followed a road aiming to intersect with the transmission lines ready to follow that towards Wayatinah to the extent it would be possible. 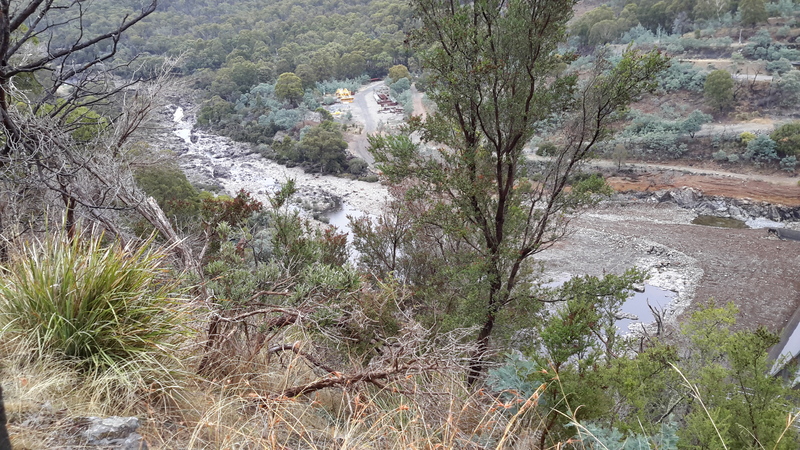 Massive heavily forested gullies made continued close access to Lake Catagunya (full of Derwent River water) impossible. Even the cleared area wasn’t clear enough for anyone to walk through on foot, although it was sufficiently clear to keep the power lines unaffected. 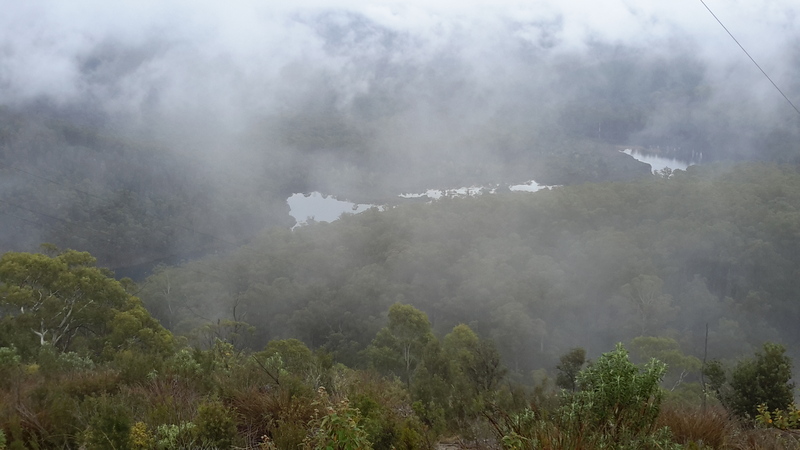 When I stood on high, misty wisps reshaped distant hills and threatened to obliterate views of Lake Catagunya. Fortunately I could always see its glistening surface way below. 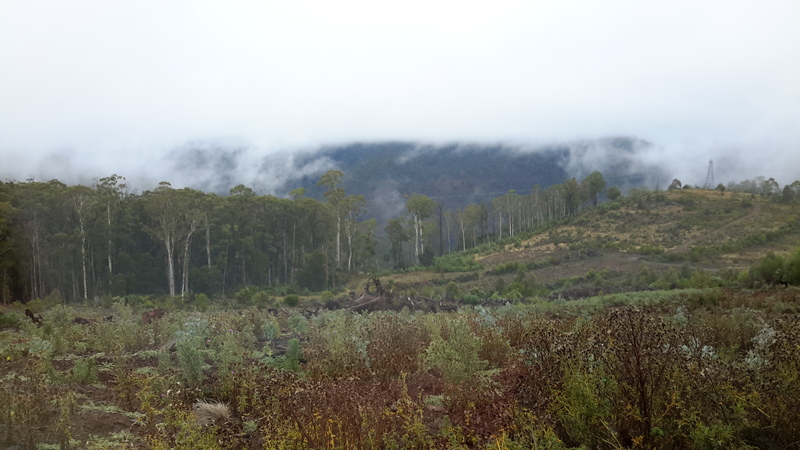 On top of the second last hill before reaching Wayatinah Power Station, the western end of Lake Catagunya appeared through the clouds. 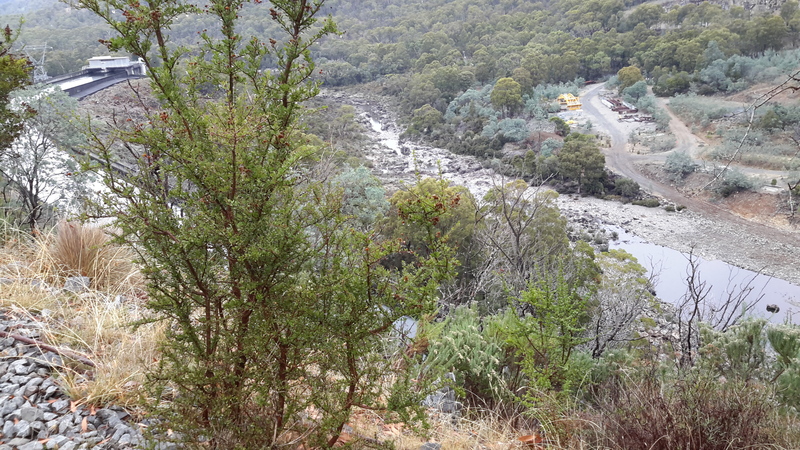 Before long the metal pipeline streaming water into the Wayatinah Power Station became visible. Often the bush was amazingly quiet. This film seems to be without sound. Only near the end can the faint crarking of a crow be heard. 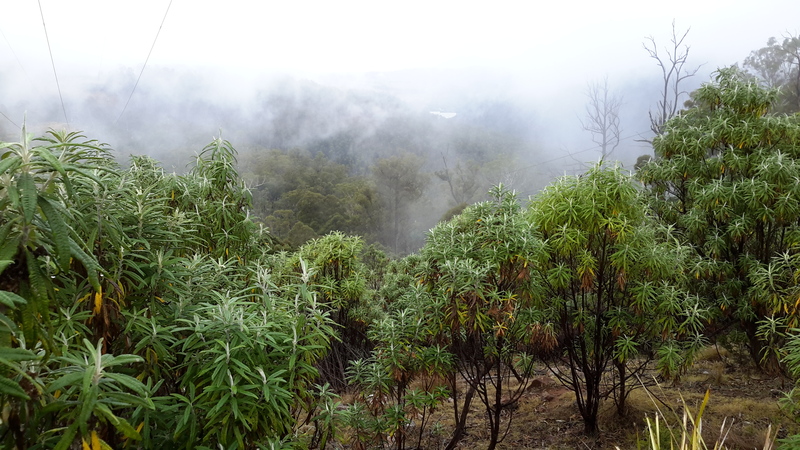 This bush silence was an unexpected beauty of my day from Catagunya to Wayatinah. 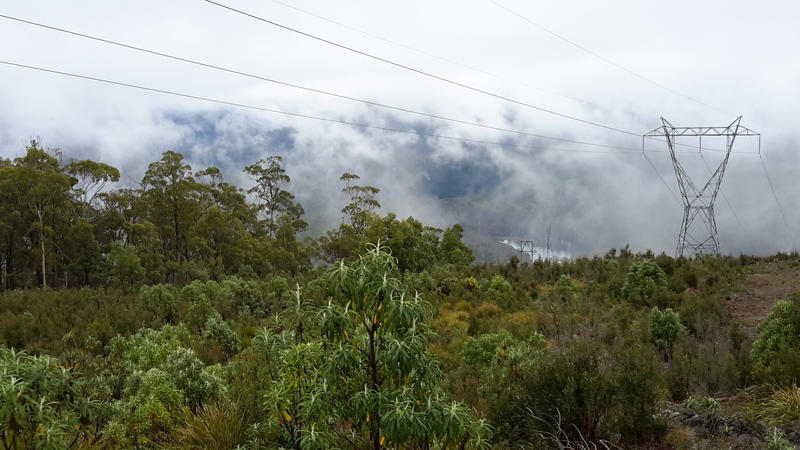 This entry was posted in Derwent River, Tasmania, Walking and tagged Catagunya, Derwent River, Lake Catagunya, power lines, Wayatinah, Wayatinah Power Station on May 3, 2017 by Tasmanian traveller. Since Andrew had walked this way, much rain had fallen so that any chance of crossing Black Bob’s Rivulet somewhere near where he walked was zero. 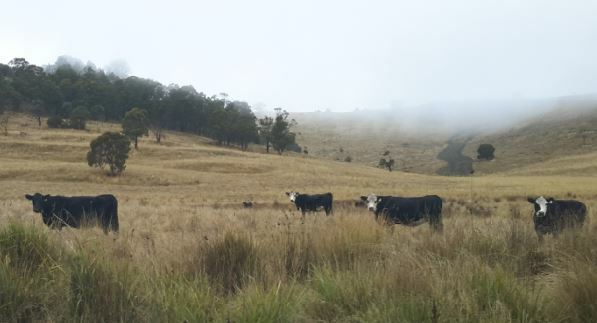 I continued back to the old Cooma property through more locked gates. The owners were in the distance checking on some of their animals. 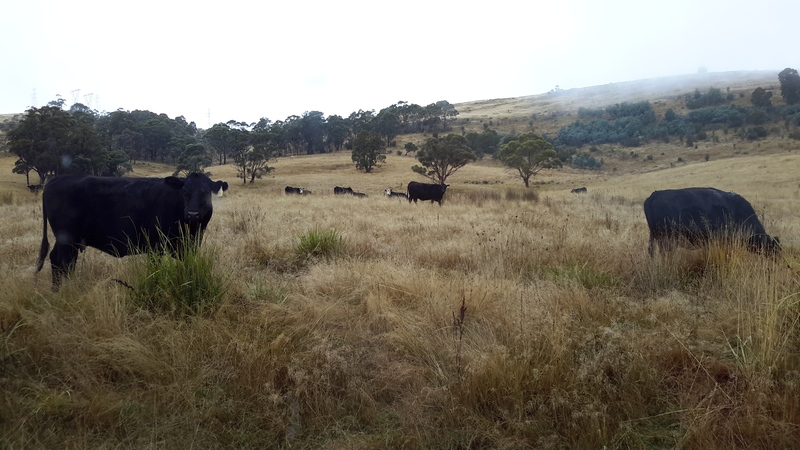 Incredibly healthy cattle wandered around the unfenced land. Big curious fellows. Superb condition. Beautiful black coats. Brown coats. Mixed colours. As usual I talked to the animals. Elsewhere, I watched a large family of yellow tailed Black Cockatoos raucously calling from tree to tree. On another occasion a rush of coloured parrots whipped through the bush with astounding speed. 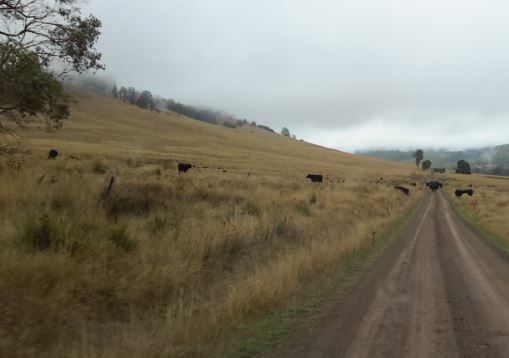 A large number of gravel roads and tracks meander over the hills between Catagunya and Wayatinah. Many do not appear on maps. Without a compass a walker could spend hours taking useless tracks – apparently people have been known to become so disoriented they find themselves way north of the river and after many kilometres back on the Lyell Highway. In part, the tracks were created to service plantation forests grown after original native forests were cleared and burnt. 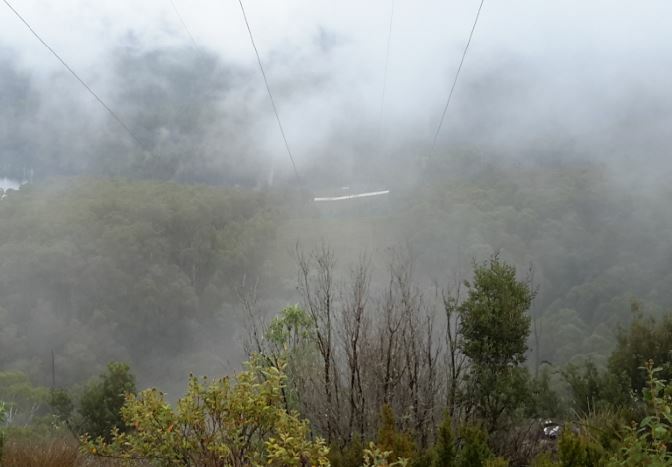 The other user is TasNetworks, the State company which travels around to access the electrical power transmission towers and to check the levels of vegetation along the transmission lines. 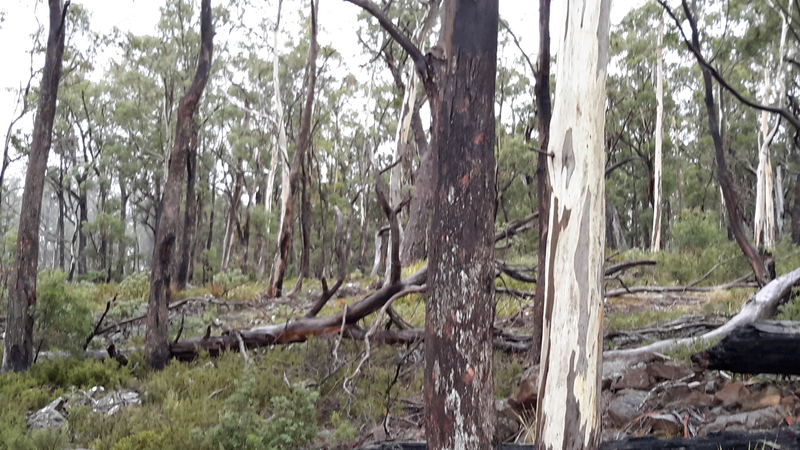 Since massive bush fires many years ago in one part of the area between Catagunya and Wayatinah, the remnants of hundreds of hectares of pine plantations have created a problem for the forestry industry. The small remaining stands of living trees are awkward to reach and not profitable to harvest. 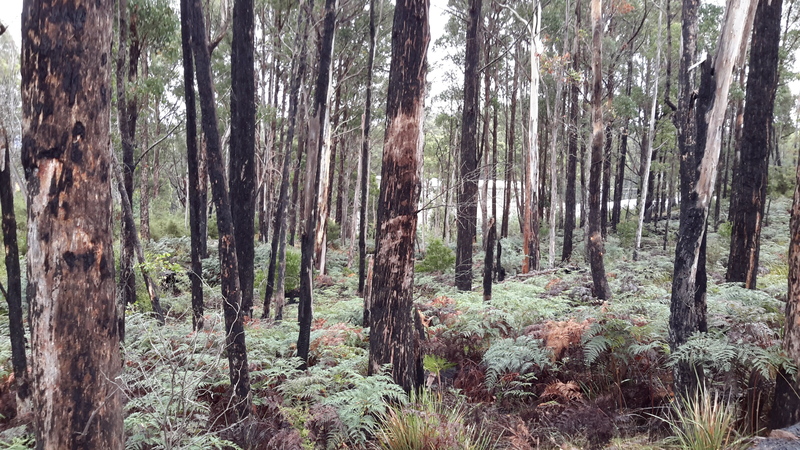 Much of the land is covered by burnt parts of trees none of which can be used. The cost to clear seems too high. Lost money. Lost opportunity. And lost original native forests. Nature always attempts to reclaim its place however in practice this means that those plants which breed well and grow quickly can create monocultures no less damaging than the single species plantation forests . 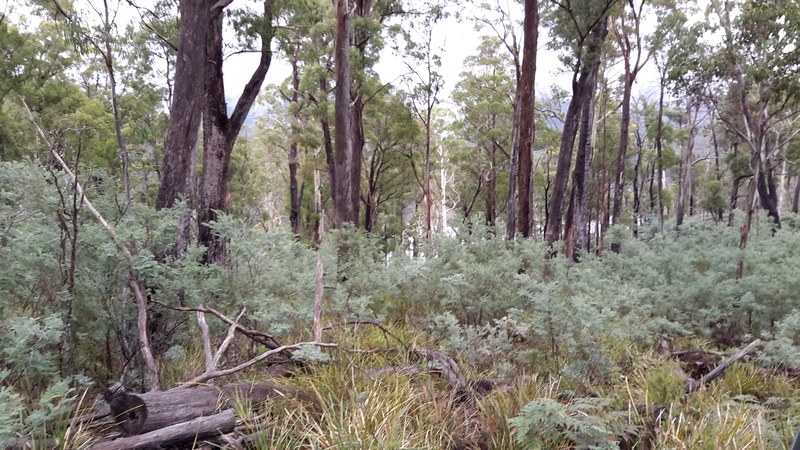 In parts along the burnt out section, native plants that act like weeds such as some wattles are already taking over. Monocultures do not a forest make. 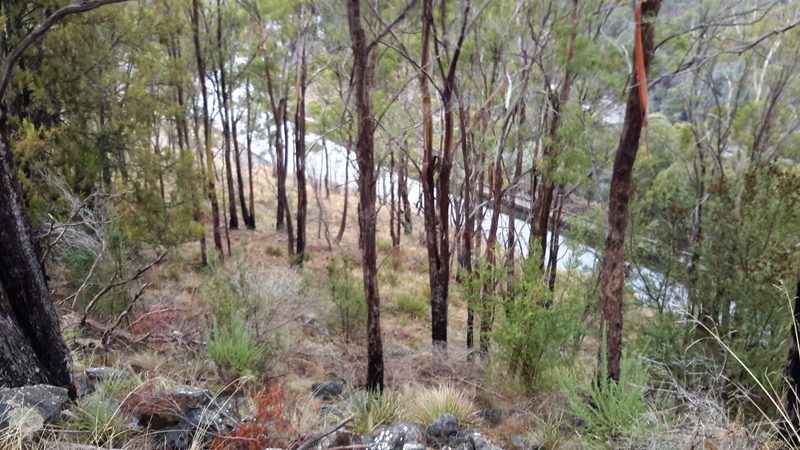 This entry was posted in Derwent River, Tasmania, Walking and tagged Black Bob's Rivulet, Black Cockatoos, Catagunya, Cooma, Lake Catagunya, Parrots, TasNetworks, Wayatinah on May 2, 2017 by Tasmanian traveller. Well over a year ago, one morning I walked through smoky air westwards into the Catagunya Power Station. After a night camping, entwined by the thick atmosphere of a far distant bush fire and desperate for water, I was relieved to be received hospitably at the Station. 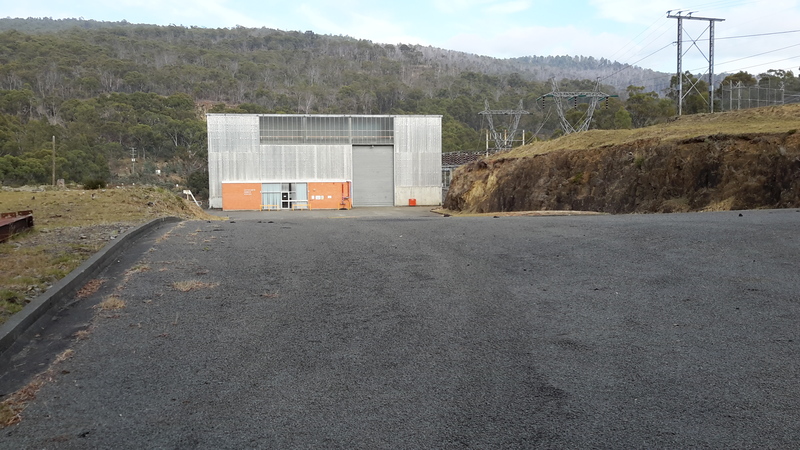 At that time I was thrilled by a guided tour of the building and its operation, however I never proceeded to walk the extra few hundred metres to look at the Dam wall holding back the large Lake Catagunya. 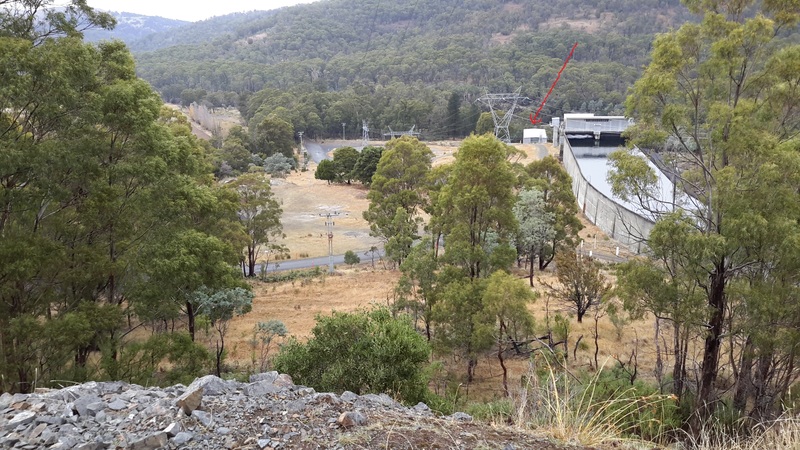 I was most grateful when many months ago, my walking proxy Andrew climbed the hills from Wayatinah Power Station to arrive at and photograph the Catagunya Dam. A blog search using “Catagunya” as the term, will help you to locate those past stories plus a swag of descriptive photographs. Recently, I was privileged to make the journey between the Catagunya and Wayatinah Power Stations and to experience that stimulating environment. 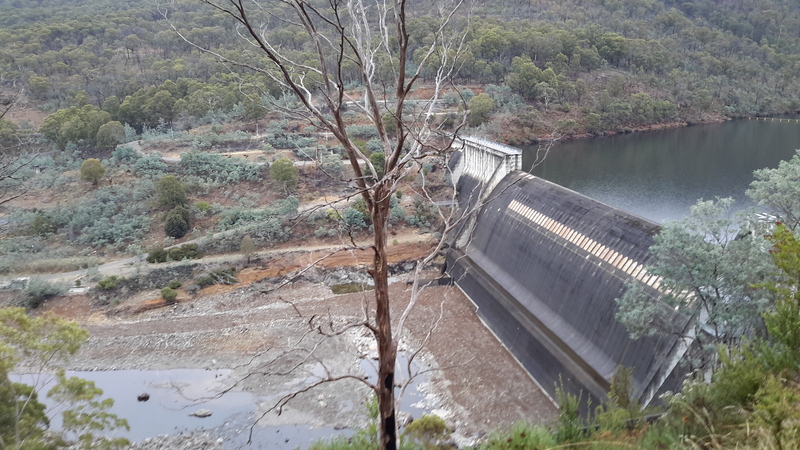 Thanks to the generous assistance of GL from TasNetworks, I was able to enter the locked Catagunya Road off the Lyell Highway, and travel the 8 or so kilometres to the Catagunya Dam. The wall of the Dam curved magnificently and the landscape-green Lake Catagunya spread impassively to the west. 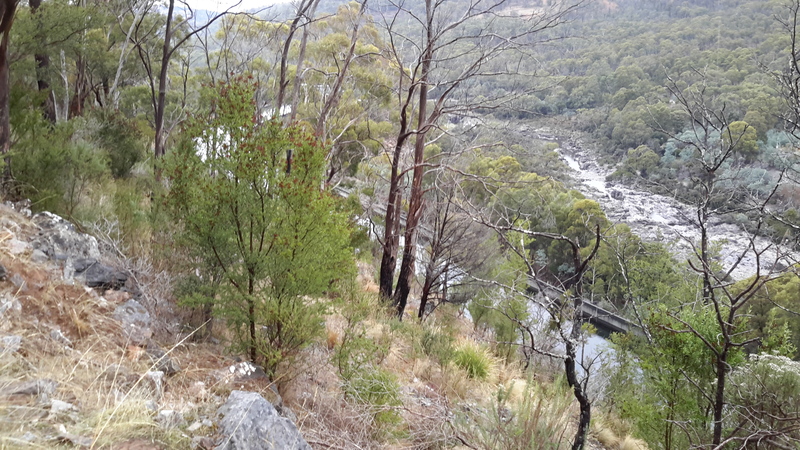 Below I could see the old Derwent River bed as a rocky almost water free pathway. Bypassing the river bed, a massive Canal drained water from the Lake into the Power Station. 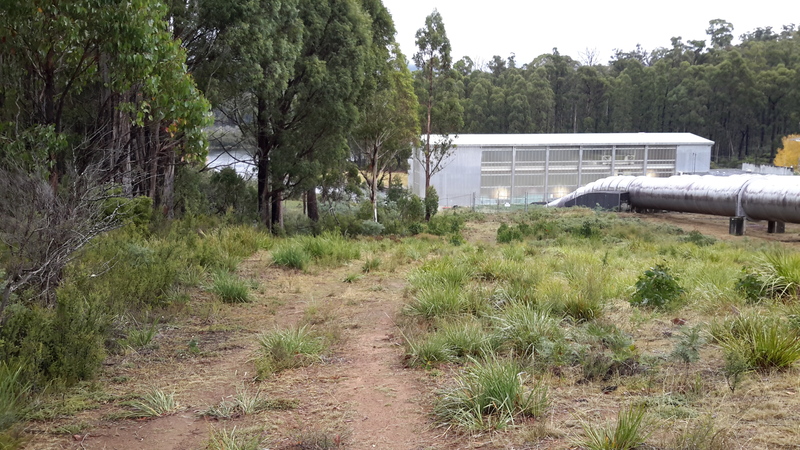 It appeared as a giant marker on the landscape that seemed much wider and more substantial than the Tarraleah Canals that run from Lake King William and the Butlers Gorge Power Station further inland. The apparently still Canal water was deceptive. Only on closer inspection could I see the dramatic gush of water moving underneath the left hand entrance at the end of the race. Obviously electrical power was being generated in the Catagunya Power Station that day. From vantage points near the Dam and the Canal I could see the Power Station building way below. Oh how tiny it seemed by comparison with the larger constructions. Yet when I had first approached and walked around it, the building seemed cavernous. More than anything I was as excited as a three year old having a birthday party with lots of surprises. 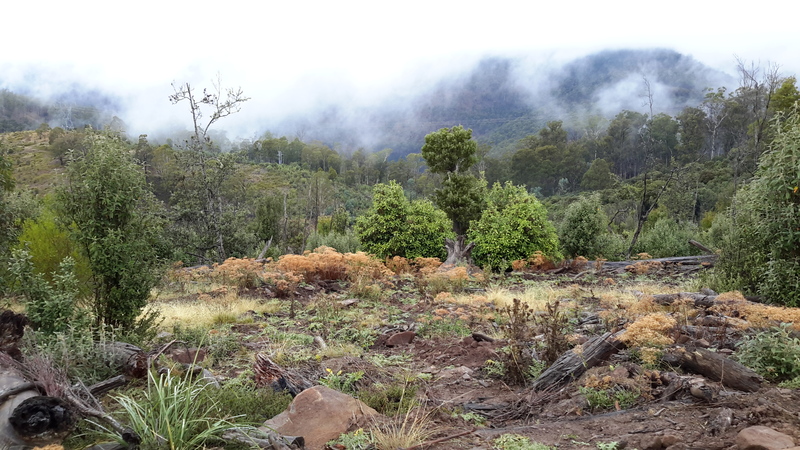 Recent rain had cleared the air of dust, the day was overcast and the fairy weight of moisture from low clouds kept the air moist. I kept breathing deeply, absorbing the cleanness of the air. Loving the damp air. Feeling cleansed. 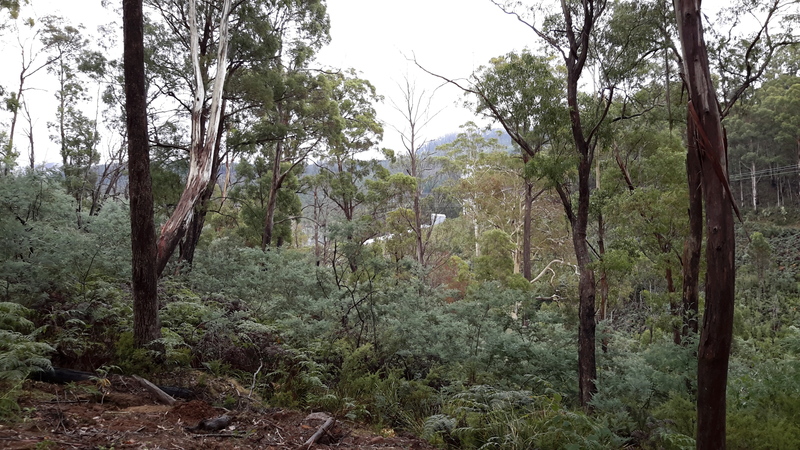 So profoundly happy to be back in the bush and walking besides my beloved Derwent River. 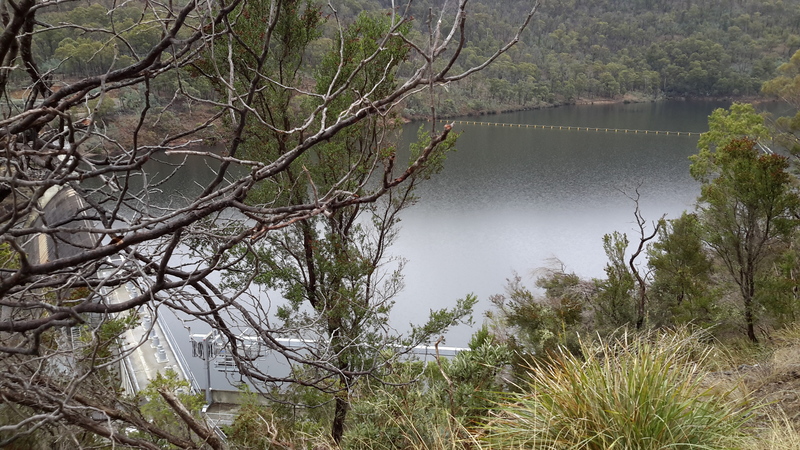 This entry was posted in Derwent River, Tasmania, Walking and tagged Butlers Gorge Power Station, Catagunya Dam, Catagunya Power Station, Derwent River, Lake Catagunya, Lake King William, Tarraleah Canals, TasNetworks, Wayatinah Power Station on May 1, 2017 by Tasmanian traveller.